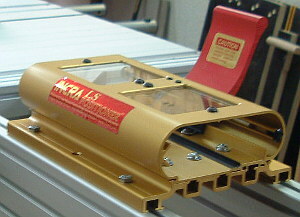 The idea: one Incra Router Fence LS-Positioner for use on both on a self-built router table and on a Festool CBS 70 table saw. This from our customer Walter H. from Kronau, Germany. 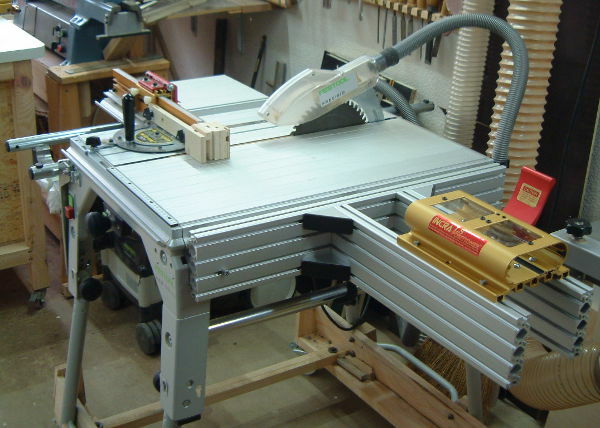 This set up saves you the investment for two router assemblies in that the second base is mounted on the table saw. He kindly sent us these photos of the way he carried out this good idea. Thanks a lot, Walter! 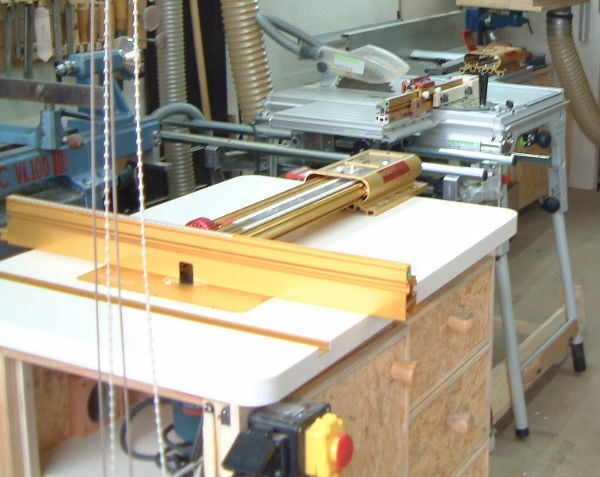 In the foreground you see the home-built router table with the Incra-Router Plate and the Incra-Router Fence (LS Positioner). In the backgroud you see the Festtool CBS 70 saw with the second mounted Base Assembly and the Incra Crosscut and Miter Gauge 1000HD. Using the commonly-found aluminum profile stock made for a robust and exact platform for the router base mounted on the table saw.
" I think that mounting of the router base on the Festool CBS 70 table saw is a success. This addition using the two aluminum profiles and cross piece is, for my small workshop, better than the method suggested by INCRA. A big advantage is that it allows me to continue to use the Festool saw’s sliding cutter feature. I also need no additional supports for the mount because the aluminum profiles (30 x 120 mm) are extremely robust and rigid mounted on their edges. So now I can use the high precision LS Positioner both on the router table and my table saw. In the top of the table, I routed a wide groove sized to permit me to use the Miter 1000 HD, which allows better precision than with the original Festool miter gauge. 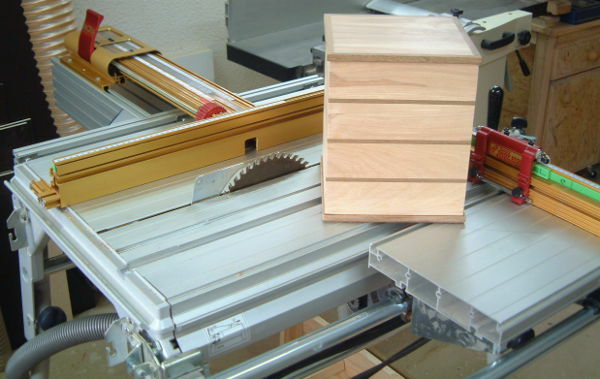 All in all the addition allows me to safely cut wood more quickly and exactly." Note: We cannot give plans for these modifications unfortunately! 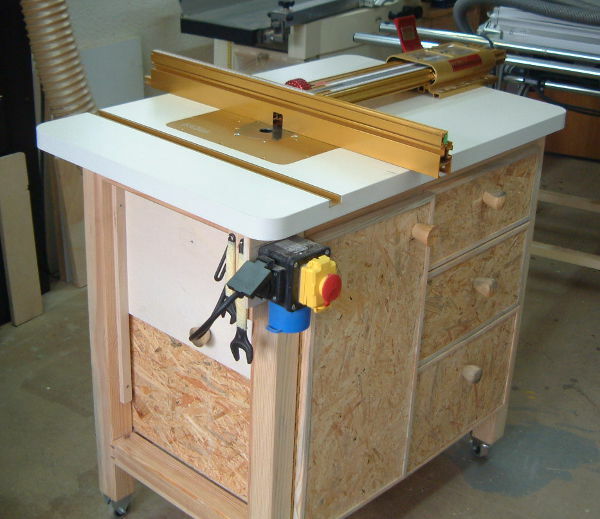 These kinds of alterations to woodworking machines are really for experienced woodworkers who also have a fair amount of experience in metal working.